How Does Clooney's 'Monuments Men' Delay Affect Oscar Season? 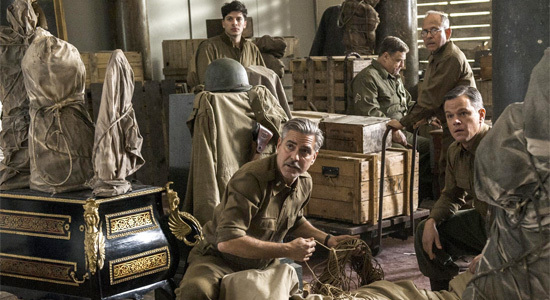 About a month or so ago, I wrote about if the Academy would be able to resist George Clooney's newest directorial effort The Monuments Men. Well, it looks like we won't have to find out, at least this year. Yes, in case you somehow haven't heard the recent news, the film is being delayed until next year. Apparently, it has nothing to do with quality, but just about getting the film right, so this isn't likely some hidden disaster being kept from our discerning eyes. However, it's a major event in the Oscar race. Crossing Clooney's movie off of your predictions will impact the Academy Awards up and down the line, but how? Whenever you have an awards hopeful leave the race, it changes up predictions and the substance of the race somewhat, but the last time this big a contender moved out, it was The Great Gatsby last year. Of course, it turned out to be that that film wasn't much of an Oscar movie to begin with, but when it went from a 2012 release to a 2013 one, it was a flick being predicted for a ton of nods. The same goes now for The Monuments Men, which could have gotten double digit citations in a perfect world. Now, it'll get zero noms this year, and frankly, with a February release date planned, will have an uphill battle to get any in 2014. So who does this help and who (if anyone, besides Clooney and his flick) does it hurt? Well, you could make the argument that it simply helps every other awards contender out there by removing one more competitor, but specifically I think it really helps 12 Years a Slave and American Hustle. Yes, the two Best Picture frontrunners right now to most (give or take Gravity and perhaps Captain Phillips) are the ones most pleased, though for the latter it also has to do with distributor Sony not having to split their efforts in selling two adult marketed awards pictures. What I mean by that is The Monuments Men and American Hustle were basically getting released around the same time in December, gunning for the same audience, and also had similar critical ambitions. It doesn't take a rocket scientist to see that that's never really a good idea for a studio to do. No, it gets room to breathe (and actually is going to open about a week earlier than was planned too) and won't have a sibling taking attention away from any attention it might receive from the Academy. As for 12 Years a Slave…the less "traditional" competitors in its way, the better a chance it stands of actually winning Best Picture. It doesn't want voters to be tempted at all be the easier sells, especially if there's any inclination among the Academy that this isn't the film they unanimously want to get behind. The folks at Fox Searchlight were definitely not unhappy with this news. On the flip side, you could argue that with less contenders, voters might not be inclined to split up their citations like they otherwise would have. This could potentially hurt smaller contenders hoping to catch the eye of a voter looking for something different. I'm not certain this will actually be what happens, but it has happened before. Variety helps all around, so a lack of that can lead to voter boredom. Back to Clooney's film. 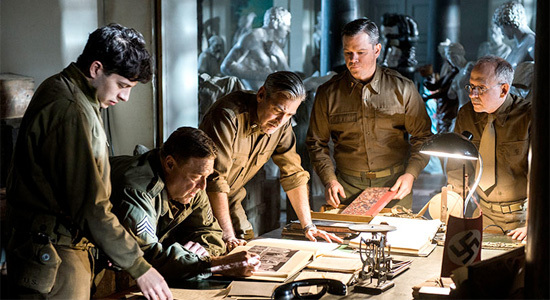 Could The Monuments Men still be an awards player next year? It's not impossible, but Oscar voters tend to ignore the first half of the year, by and large. Every so often, a movie like Eternal Sunshine of the Spotless Mind can parlay an early release (that one came out in March) into late year love, but just ask Martin Scorsese about how a February release date impacted the chances of Shutter Island getting even a technical citation. The money will certainly come in for the film now, but the awards and nominations? Not so much it seems. In February, we'll find out if The Monuments Men was good enough to have warranted anything anyway, but for now we'll just be left to speculate and wonder about what might have been. It's probably unlikely that it would have won Best Picture (though again, who knows? ), but it definitely wouldn't have been shut out. It'll be interesting to see what replaces it in the eventual lineup of nominees. I know that when I updated my predictions (which I'll be updating again and sharing with you all early next month) I had to move Clooney and his movie out of a ton of spots, so the race has certainly been altered. In the end, the Oscar season has simply gotten one more twist to be added to it. Between Foxcatcher moving, The Wolf of Wall Street moving before apparently returning, and now The Monuments Men moving, pundits like myself have definitely been kept on our toes. And to think…it's still only October. I can only imagine what's going to happen between now and the evening of the Oscarss. I'd be disappointed if we didn't get at least one or two more surprises, but I'm sure we will. You can take that one to the bank. Very interested to see how the rest of the season adjusts to losing such a potential heavy hitter. "In a perfect world," Gene Jones would get nominated for best supporting actor for his work in The Sacrament and Adele Exarchopoulos nominated for best actress in Blue is the Warmest Color. I was hoping to see it, yes. Maybe next time for George Clooney? Eager to see this one next month.